The Red Shed is the third part of our favourite campaigning comic’s theatrical trilogy, following the much revered Bravo Figaro and Cuckooed. 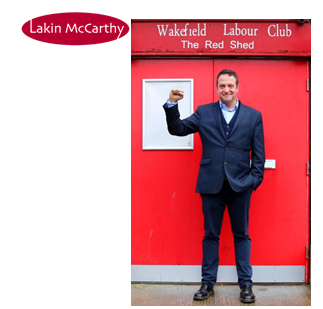 Mark returns to the place where it all began – the Red Shed, a labour club in Wakefield – to celebrate the club’s 50th birthday as he continues his tour in 2017 of yet another award-winning, highly acclaimed performance. The Shed, home to Mark’s first public performances, is also a home to dissent, to organising and to progressive politics, and so it was here that Mark’s true political prowess began. An iconic and vital place for its patrons, this is where the true meaning of solidarity is found and where you can be part of history and part of the struggle. A south London lad, born to a Thatcherite world of self-employed builders, labourers and tradesman like his father where the individual is key, Wakefield’s alien traditional labour community awoke a new determination in Mark and changed his life forever. Interviewing old friends and comrades, Mark pieces together the club’s history and works alongside it to campaign with some of the poorest workers in the country. It is the story of the battle for hope and the survival of a community. It is a tale of strikes, fights, dinner ladies, crap beer, good beer, burger slingers, pickets, placards, commies, friendship, love, history, dreams and, above all, remembering. Part theatre, part stand up, part journalism, part activism, Mark realises his obsession with community and struggle. With every one of his previous solo shows selling out their Edinburgh runs, snapping up awards and nominations and becoming a Radio 4 series, the Fringe would not be the same without this ‘alleged comedian’s’ explorations. He’s won a Herald Angel award, the Amnesty International Freedom of Expression award and The Red Shed this year won him his third Scotsman Fringe First alongside The Stage Special Award. He’s stopped arms deals, created a manifesto and brought the winning policy to parliament, walked the entire length of the Israeli wall in the West Bank, filmed his own Channel 4 series, written books, won more awards, held Guinness World Records, investigated everything from Coca-Cola to inheritance tax avoidance, given evidence to Parliamentary Select Committees, stopped multinational infrastructure deals, been arrested on numerous occasions and founded a new definition for the word ‘Farage’.